When we try out for something, or go on an interview, our first goal is to make sure that we are doing everything right. In essence–we put our best foot forward. 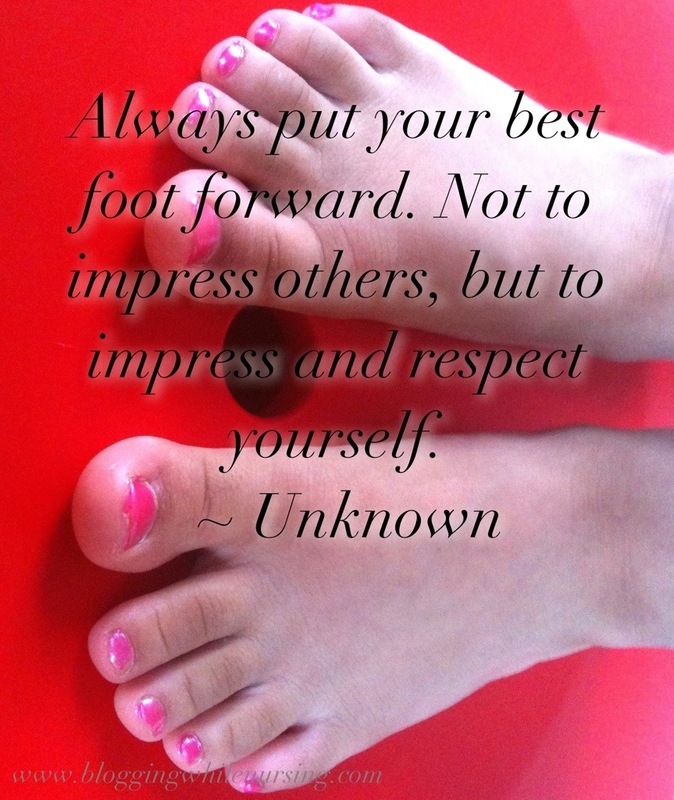 But I am wondering here–Shouldn’t we put our best foot forward everyday? Sometimes we are all caught up on the “first impressions,” but little do we know that our actions daily can make or break that first impression. How am I coming off to other people? Because at the end of the day, our actions, and words are shaping other people’s opinion. Let’s hope we are shaping the right one. I get that everyday is not possible, but we can at least try. 13 Comments on "Best Foot Forward"
Yes, yes, yes! I have a problem with the whole “be on your best behavior” because it’s like acting. eventually your true colors are going to come out, so why not be your best all the time?! You are so right, doing it once in a while us like acting, but to be consistently our best with ourselves and with other people–always, is way more natural. I agree, I think in interviews there is a little game play on both sides because the interviewee wants to say what the interviewer wants to hear. And visa versa. Lately I have been practicing to pause and think before I answer someone because the first answer that pops into my head may not only be the best answer, but not how I want to come off..if that makes any sense. I do agree with you however, we can at least try. People will judge you based on your actions and how you handle things. Sadly how you answer questions is a form of judgement. I don’t like interviews I always answer a question with a question one interviewer actually liked that a lot. I think how we see ourselves and how others see us is so different. Yup, the interview is definitely a judgement time and you are right, we are judged based on our actions. I think that is why the first 90 days will either make or break us in a new job. I hate interviews, but unfortunately we have to answer those canned questions in a way that present us in the best light. I think you have to find that balance between putting your best foot forward and letting the real you shine through. Yup, balance is the key for sure! This is hard to do but I would hope that when I’m not at 100% that my routine would speak for me. I’ve noticed that as far as work goes, when I’m working fitness wise, I’m able to leave everything at the door. This is not true for my primary job. It’s so important to find fulfilling work that you are passionate about and effortlessly put your best foot forward daily. This is so true, through fulfilling work and things that you are passionate about, our best foot, or the best of us just comes out. I think that’s the hard part though, finding something that motivates you. You would have to know yourself well enough. I believe the only way to be at your best, is to be at your best for the Lord. If you are doing your work, as though it was in adoration and joy of Him, you will always be at your best, even when you are feeling less than your best. Does that make sense? Hope so! Kalley, come by and join my blog. My giveaways are limited to those who comment and join my blog. You have such insightful comments. I want to enter you in the next giveaway. Everyone is welcome!